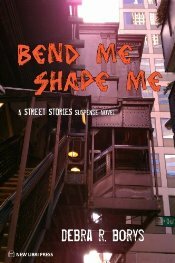 Debbie Haupt at The Reading Frenzy asked me some great questions about Bend Me, Shape Me and about street kids. I hope you click through to read the whole thing, but here is a tiny taste of what I had to say. Debra, you’ve volunteered working with what you term “throwaway youth.” What is one thing any of us can do to help even one teen off the streets? The one thing everyone can and should do is very simple. Notice them. Smile as you pass, maybe even say hi. If they ask you for money and you don’t want to give them any, just smile politely and say, “Sorry, I can’t today.” Nine times out of ten, if you treat them with respect, they will return the favor. Being treated as invisible and contemptuous only erodes a person’s self-esteem which leads to antisocial anger and/or depression. Once you start doing this, you might find yourself taking the next step, which is to engage with them. Offer to buy them a bag of chips or something from the local drug store. Stop and talk a minute. Learn their name. Find out more about them if they are willing to share. Seeing them as people not that much different from ourselves is the first step toward social changes that could make great strides in eliminating homelessness. Is there a light at the end of the tunnel for any of these youth? There is always a light at the end of the tunnel. Even if some of them don’t get there in time. It’s like Jack, the Night Moves therapist in Painted Black, says, “All you can do is try to save them all, and hope none of the good ones slip away.” Youth workers and volunteers around the country are making huge differences in the lives of individual kids through the many programs, opportunities and shelters out there. There is much more hope for the youth than there is for some of the adults who are chronically homeless. The kids still have time and enthusiasm and energy to help them fight through to the brighter side. What’s the biggest false belief we have of homeless teens? That they are the juvenile delinquent versions of the smart-mouthed egotistical teens we know with homes but no respect for others. I would trust most of the street kids I got to know and received more respect from them then I do from some privileged kids with bright futures and parents willing to bail them out of every jam. Street kids come in all sizes, ethnicities, abilities and personalities but I’ve found them to be more appreciative of what little they have than those who have pretty much anything they want. via The Reading Frenzy: Interview with Debra Borys-Bend Me Shape Me-about the real life tragedy that is homeless teens. I’m really pleased with how this interview turned out at The Reading Frenzy and I would love to hear if anything I say in it makes you think about the plight of homeless teens.